This little rabbit found the best place to take a nap. 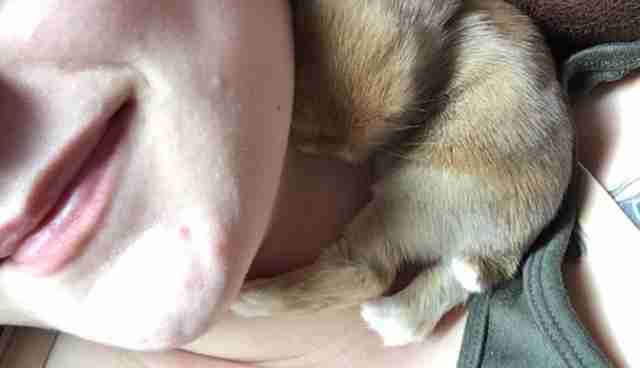 Reddit user Shelby Schmidt shared a photo last week of nap time with the days-old rabbit, who dozed off as he curled up beneath her chin. "I have died and gone to heaven," she wrote about the photo. "It also grooms me ... tiny little itty bitty kisses and nibbles." But while the photo's adorable, Schmidt told The Dodo she is hoping her story will raise awareness about why people shouldn't be breeding their rabbits. 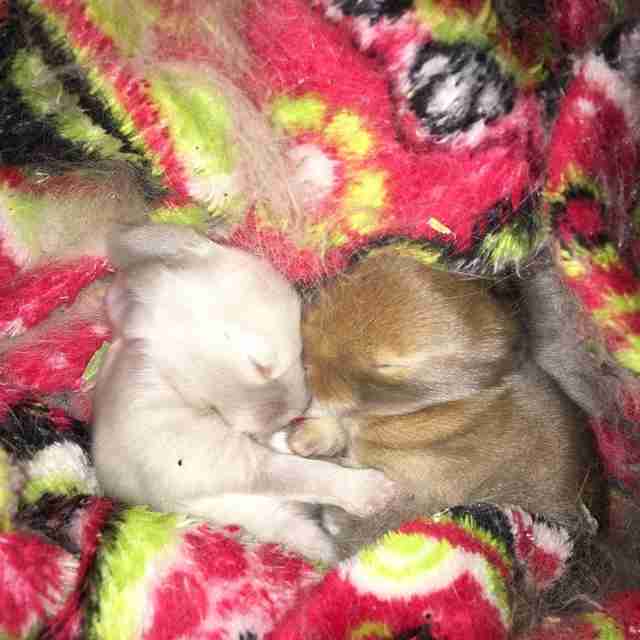 Schmidt is the proud owner of two rabbits, a female named Lucy and a male named Gordon. As they were still too young to be fixed, she was keeping them separately in large pens until they could be neutered and introduced. But last month, she noticed that Lucy was becoming a bit less sweet. "[She] was acting very strange and being very rude," Schmidt said. "I assumed it was puberty and hoped it would pass! I came home after work on March 21 ... and there was fur all over her cage and in her bed, then the bed squirmed." 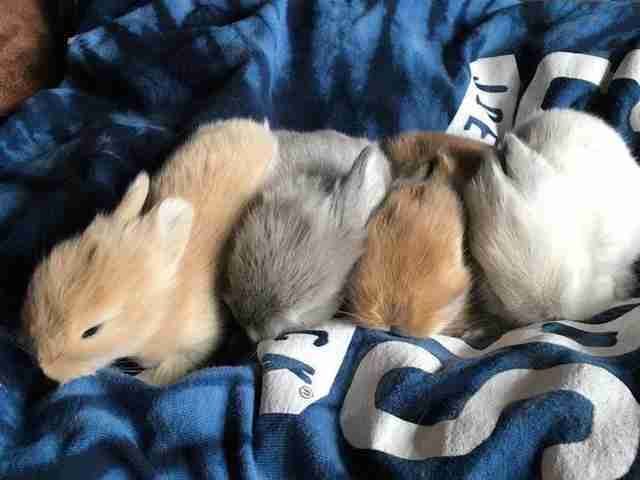 Inside the fur-filled nest were four tiny little newborn rabbits. Naturally, Schmidt was puzzled. "My boyfriend and I kept going over everything and we couldn't figure out how she got pregnant," she said. She even texted her roommate, but he said he had no idea how it happened. A few minutes later, however, the roommate came clean. Apparently Schmidt had accounted for everything but the romantic influence of alcohol. The roommate said he had come home drunk one night and, in his intoxicated state, decided he "felt bad" for Gordon, who was cut off from his lady love - so he dropped him into Lucy's cage. Within seconds they were doing what rabbits do best. "He said he pulled him out quickly because they 'started going at immediately,'" Schmidt said. "He didn't think anything of it until I asked." But it only takes a second, and so Schmidt found herself "four bunnies richer" thanks to a roommate who, in her words, "doesn't understand the birds and the bees." While Schmidt was initially frustrated at bringing an extra litter of rabbits into the world - rabbits are the third most euthanized animals after cats and dogs - she's making the best of her situation. She scheduled a neuter for Gordon, and Lucy will be spayed later this summer. She's also working on finding good homes for the babies. She said she hopes they remind people "about the importance of spaying and neutering pet rabbits." 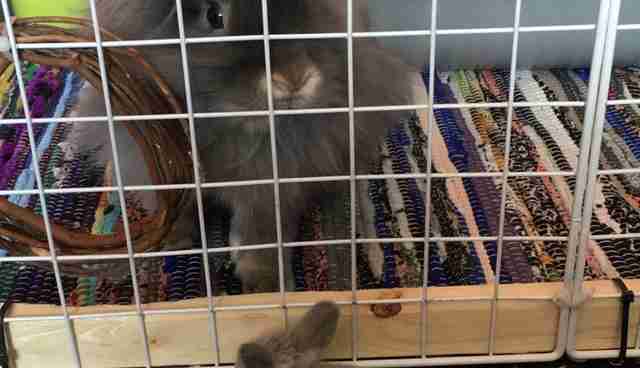 "I was being a very responsible rabbit owner and had planned to bond my two after they were fixed at the right ages for them both, so that we could avoid adding to the population problem," Schmidt said. "I do see the babies as blessings now that they are here and I love them dearly, but they are the product of someone being irresponsible and under-educated." 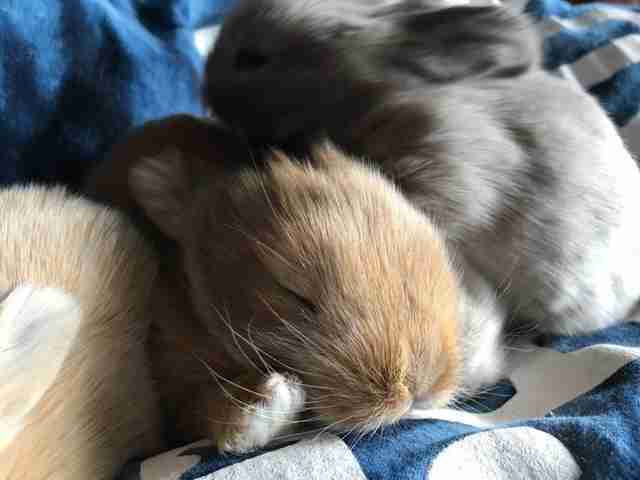 But for now, she's enjoying her time with the ill-advised but admittedly cute little rabbits. And as for the roommate? "He's on thin ice," Schmidt said. Each year, thousands of rabbits like these end up abandoned in shelters. Thinking of giving one a home? Make sure you do your research, then get started at Adopt-a-Pet.com.